Just a couple of pics from my walk by the White House today. It was bizarre. 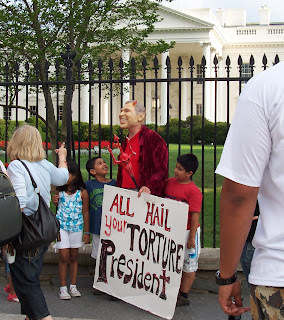 This is a protester in front of the White House. The strange part was this mother and her kids. They were visiting the U.S. and the woman was thrilled to have her kids pose with this Bush/devil person. With a thick accent, she asked her kids, "Do you like George Bush?" (Pronounced "Jorj Boooosh") They jumped around giggling and yelled, "YEAH!" and she ushered them over to have their pictures taken. It was the same reaction a family has when they run into Mickey Mouse at Disney World. She thanked him repeatedly and walked away with a big smile. It was strange. Was she excited to run into a protester? Was it cool to see someone in a Bush mask to put in her vacation album? Was she just glad to photograph someone who hates Bush? Maybe she's just really into torture. I can't imagine what she was thinking, but the photos are too weird not to share. I'm waiting for your McCain comments. What happens when you mix politics and tourists? Photos like this!